This past weekend Iowa Democratic Party leaders ratified their new plan for conducting and tabulating the results of the 2020 Iowa Caucuses and two of the party’s high-profile presidential candidates made a dozen campaign appearances in the state. About 300 people gathered on the William Penn University campus in Oskaloosa to see Vermont Senator Bernie Sanders. Sanders said Americans were swayed by Donald Trump’s false promises in 2016. 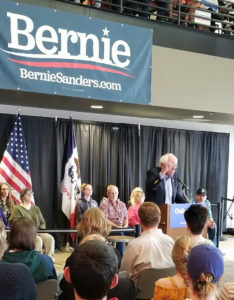 Later Sunday afternoon in Malcolm, Sanders joked he was nervous about coming back to Iowa because Trump said the noise from wind turbines causes cancer. Former Texas Senator Beto O’Rourke told an audience in Iowa City on Sunday there’s a basic fix to the nation’s thorny disagreements. O’Rourke, speaking to a crowd in the University of Iowa’s Memorial Union, said the nation’s democratic institutions need to be revived and he called for passage of a new Voting Rights Act. O’Rourke and Sanders are raising millions from tens of thousands of donors, putting them at the top of the campaigning fundraising leader board with California Senator Kamala Harris. As for who’ll be the leader next February on Caucus Night, Iowa Democratic Party officials for the first time will release a raw vote total and have “virtual” Caucuses beforehand for people who can’t attend the Caucus Night precinct meetings. The Iowa Democratic Party state central committee approved those details during its meeting on Saturday.